Whether it’s redecorating, a do-it-yourself project, or gardening … there’s an App for that! Smart Phone technology has made things a whole lot easier for homeowners. We thought you might like these ten apps for your home. There’s no need to paint a ton of different paint samples on your walls. 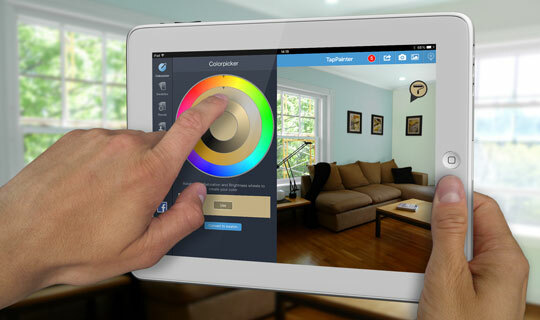 With Tappainter you can see how your whole room will look in your selected colours. It lets you choose from a colour wheel, a fan deck, or enter the code of the colour. Tappainter takes the guess work out of choosing a colour for a room. Take a photo of your wall, select a colour and recolour your wall! Have you ever seen a colour somewhere and thought – I’d love that colour in my home? 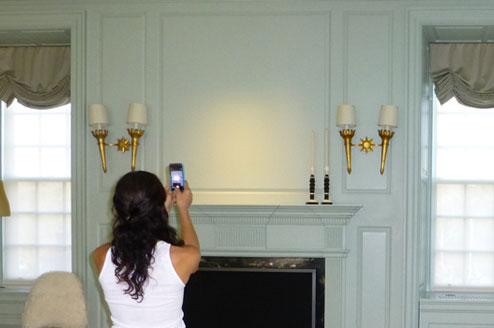 The Benjamin Moore Color Capture App will help you find that exact match. 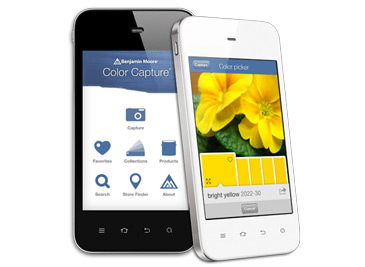 Snap a picture of anything that catches your eye, and the app finds the colour match, plus suggests coordinating colours. We tried the the Color Capture App in our feature photo. Now you can see how a piece of furniture will look in your home before you buy it. 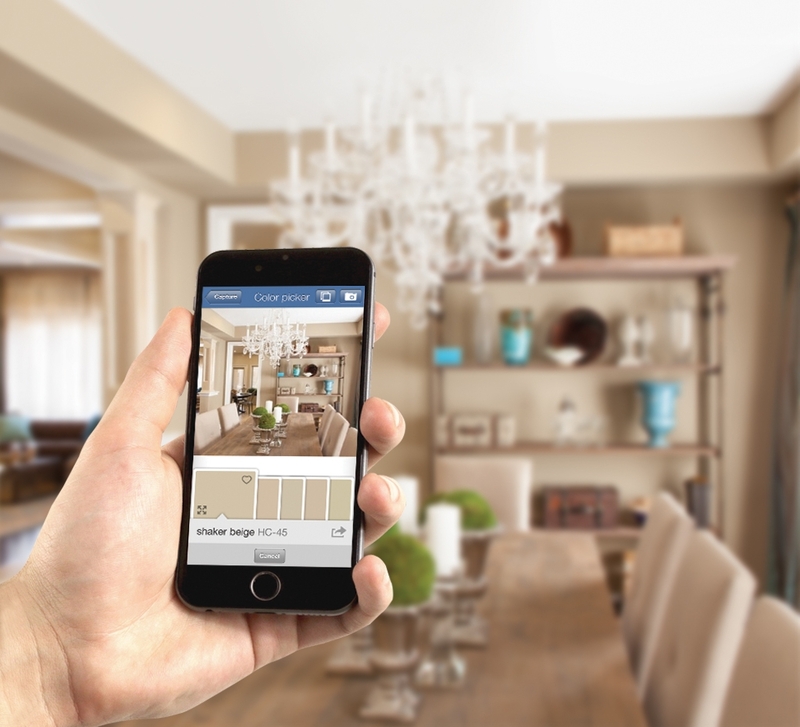 Take a photo of your space and with the Homestyler Interior Design app, your smart phone will transform it into a virtual room where you can place furniture, décor items, and even hang light fixtures! The Homestyler app lets you experiment with different ideas using real products. There are so many things you can do to create your room with Homestyler. Whenever you’re updating a room or buying new furniture, it’s important to have the proper room measurements right at hand. 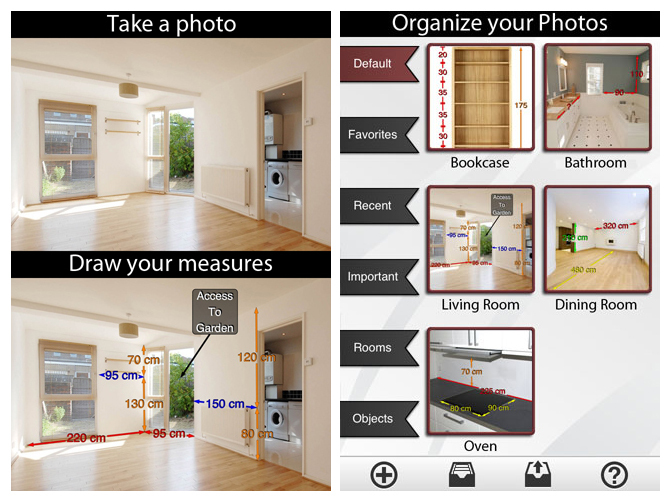 The Photo Measures app lets you draw all the dimensions of your walls and floor right on to a photo of your room! 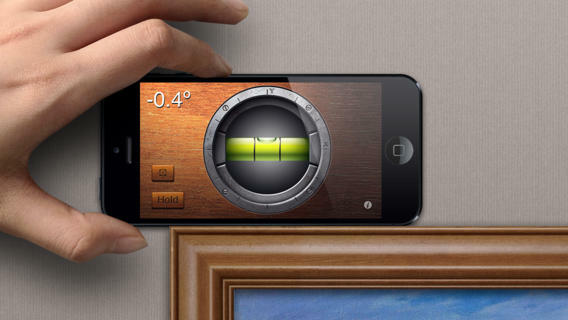 Photo Measures keeps your room and furniture measurements at your fingertips. Curate makes it easy to see and share how pictures will look on your walls. 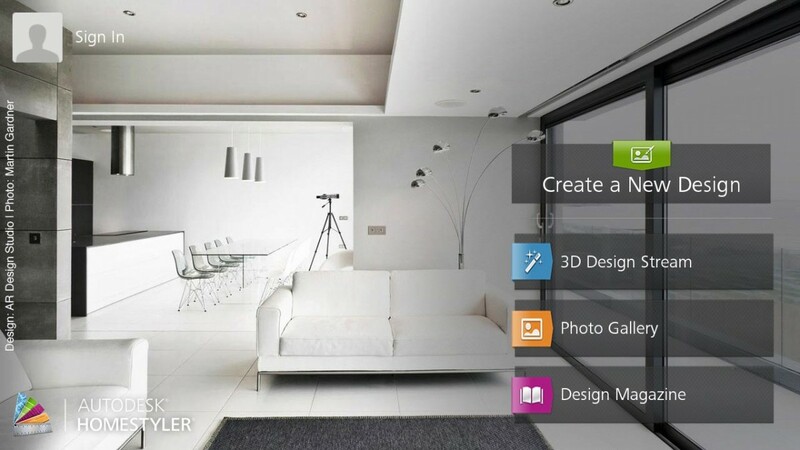 Using photos of your actual room, you can move your pictures around on the app to decide on the perfect layout. Need a second opinion? You can even share your creations with friends, right from your phone. Find something you like? See it on your walls instantly with Curate. Using a level has never been so easy as it is with iHandy. Hang frames with confidence when using this handy app. Now you’ve got a level always within easy reach! You’ll keep a level head with the iHandy app. Find your favourite furniture and decor with the LikeThat app. 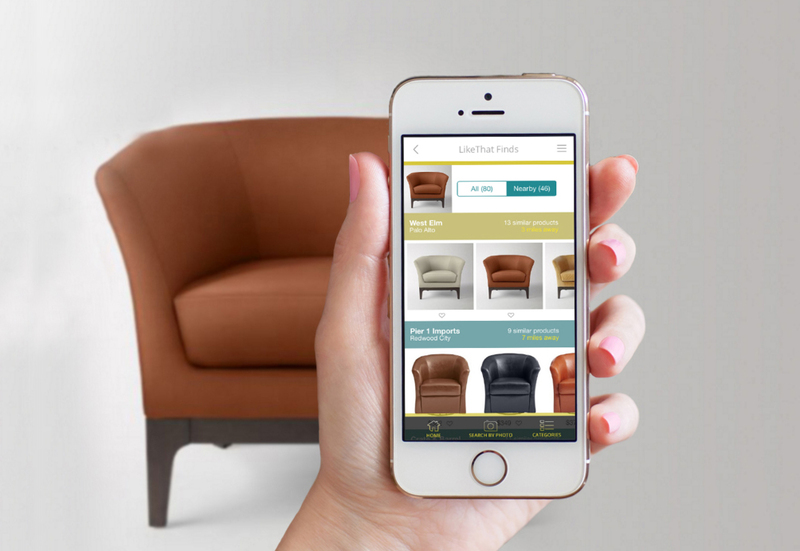 LikeThat Décor and Furniture lets you shop with the phone’s camera! Take a picture of the piece of furniture or décor you like, and the app will show you similar products from various stores! LikeThat saves you both time and money. It will even show you how the pros would style and pair it with other pieces. LikeThat will save you time and money. LikeThat also has an app to help with the gardening. See a plant or flower you like? Snap a picture, and get the name, detailed description and helpful tips in caring for the plant. This is a must-have for home gardeners! LikeThat is like Shazam for the garden! Use your phone to improve your yard too. iScape lets you design a spectacular landscape right on your phone. 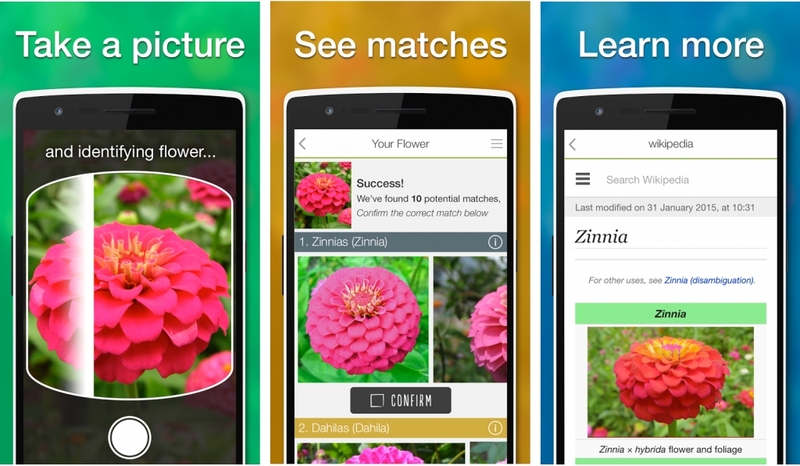 Featured on Home and Garden Shows, this app lets you place flowers, plants, trees, and garden decorations just how you want them to see how it looks before planting. Just imagine the potential for your yard! 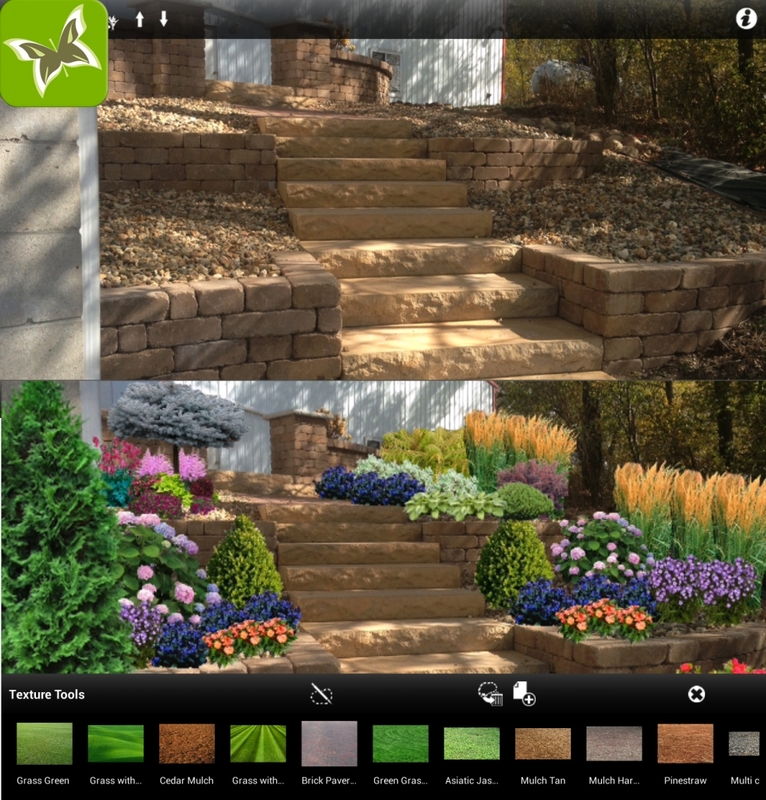 It’s easy to transform your garden with the iScape app. 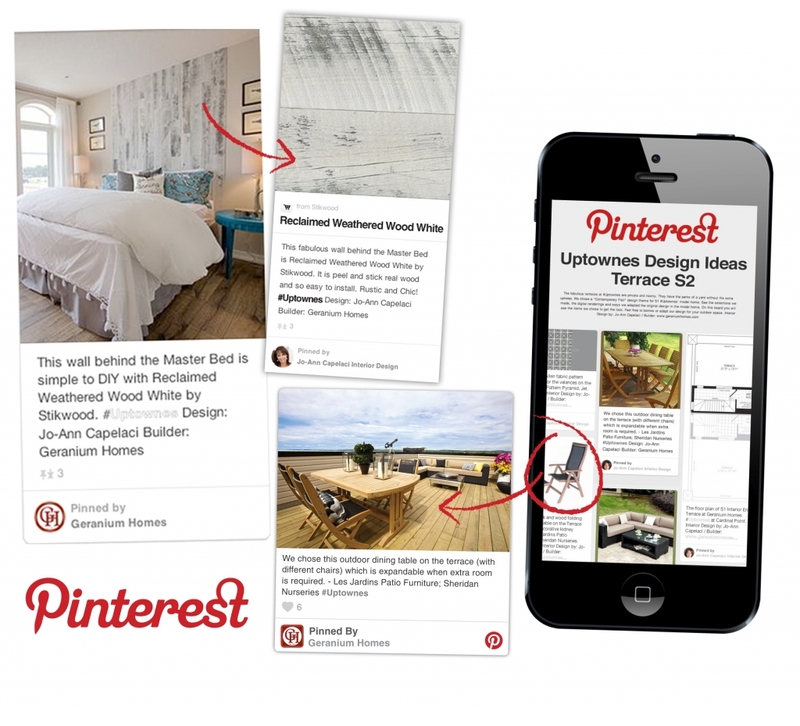 Pinterest is the ultimate app for your home. Find decoration inspiration, gardening ideas, DIY tips and tricks, and recipes you’ll love. Follow Geranium Homes on Pinterest for all of our favourite things! Geranium Homes’ Pinterest pages always offers lots of inspiration for home owners. There’s an endless supply of home ideas, tips, and help available right at your fingertips, so what are you waiting for? Choose one of the apps and let’s get started!